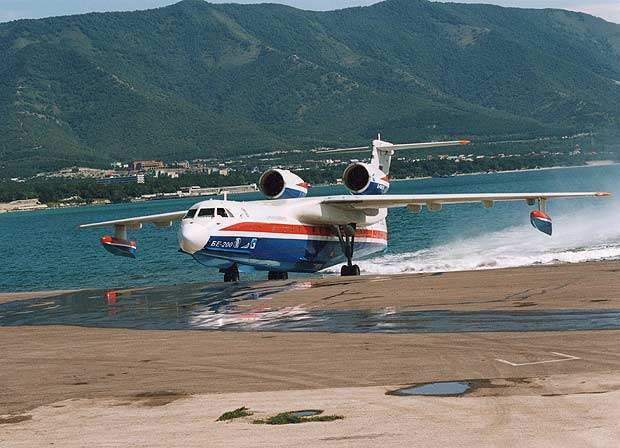 The Beriev Be-200 amphibious multirole twinjet. 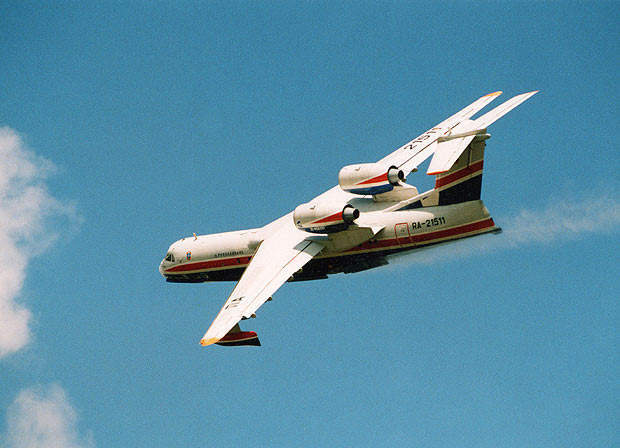 The Be-200 can be configured as a freighter, a passenger aircraft or as an amphibious water-drop firefighting aircraft. The aircraft has four retractable water scoops, capable of scooping 12t of water. The aircraft can also be equipped for special missions, such as an air ambulance. 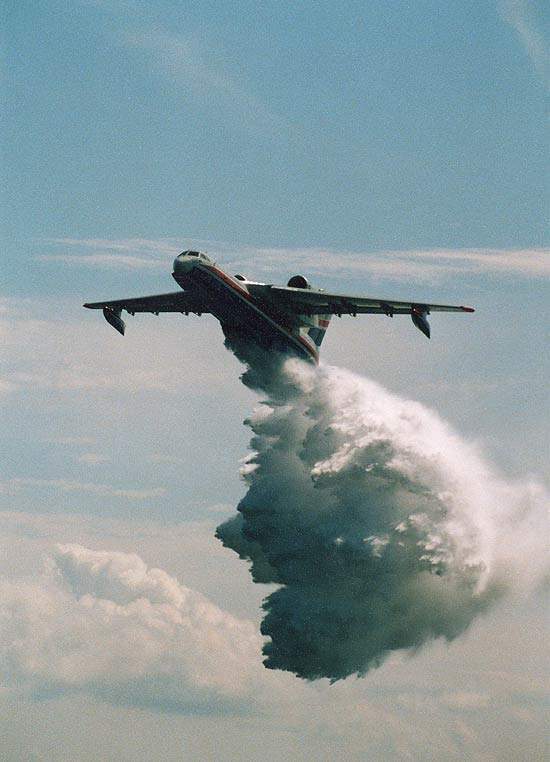 The firefighting aircraft can empty its water tanks over the site of the fire in 0.8 to 1.0 seconds. Water can either be loaded at an airfield or scooped on gliding over the water surface within 14 seconds. Mission control consoles for the firefighting aircraft. The D-436TP turbofan engines are rated at 73.6kN each. 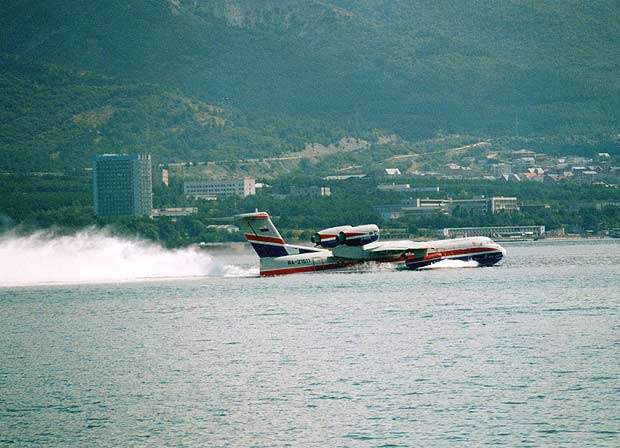 The Beriev Be-200 is an amphibious multirole turbofan aircraft designed by the Berieva Aviatsionnyi Kompaniya (Beriev Aviation Company), with the Russian Irkutsk Aircraft Production Association (IAPO) responsible for the production engineering development phase of the programme. The first flight took place in 1998 and the aircraft was first seen in the west at the 1999 Paris Air Show. IAPO (now part of the Irkut Corporation) and EADS signed a memorandum of understanding in May 2002 to jointly carry out a market study and to define the conditions and costs of international certification and the logistics of setting up a worldwide after-sales service. The study was completed in July 2003 and the two companies, with Rolls-Royce Deutschland, plan to obtain Western certification and offer the aircraft for Western markets. It is planned to power the aircraft with Rolls-Royce BR715 engines. 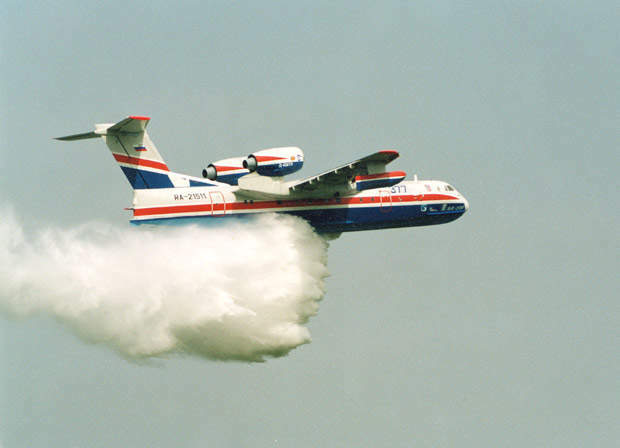 The Beriev Be-200 was first developed for firefighting missions. It can start, take-off and land on water and can carry a load of 12t of water. The first prototype aircraft has successfully completed 650 flight hours and carries Russian certification as a firefighting aircraft. Seven aircraft are on order for the launch customer, TsENTROSPAS/MChS or the Russian Ministry of Emergency Situations. The first was delivered in June 2003 and deliveries were completed in 2008. Two Be-200 aircraft were used to fight the devastating forest fires in Greece in the summer of 2007 and, in December 2007, Greece placed an order for an undisclosed number of Be-200 aircraft. 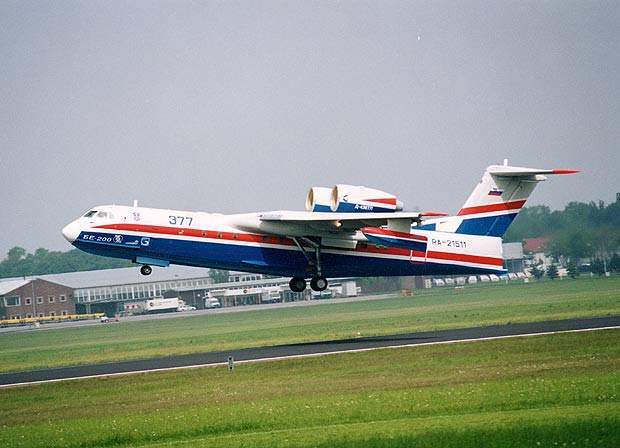 The Russian Navy has announced plans to acquire four Be-200 aircraft for search and rescue (SAR) operations. A military version, equipped with the Sea Dragon anti-submarine warfare (ASW) system, is also being considered. In August 2004, Irkut leased one aircraft to the Protezione Civile of Italy for firefighting. The aircraft began operations in July 2005, on the island of Sardinia. In June 2006, the Ministry of Internal Administration of Portugal signed a contract with Irkut for the lease of one Be-200 from July 2006 for firefighting. The multirole aircraft can be configured as a freighter, a passenger aircraft (Be-210) or as an amphibious water drop firefighting aircraft. The aircraft can also be equipped for special missions, such as an air ambulance for 30 stretcher patients and seven seated patients or medical crew. In the search and rescue role, the aircraft is equipped with searchlights and sensors, and a suite of medical equipment. The aircraft is also capable of being configured for an anti-submarine warfare role and fitted with equipment to the customer country’s operational requirements. The firefighter aircraft has 12m³ ferric aluminium alloy water tanks under the cabin floor in the centre fuselage section. There are four retractable water scoops, two installed forward of the step and two after the step. The water tanks can be removed quickly for carrying cargo. Fire-retarding chemicals can be added to the water using a centrifugal pump. There are six tanks for these substances, with a total volume of 1.2m³, installed on the aircraft. In a firefighting mission, the fully fuelled aircraft can fly 200km from the airfield to a water reservoir, make successive trips between the site of the fire and the reservoir (over a range of 10km from the fire zone to the reservoir), to drop a total of 310,000kg of water on the fire and make the 200km return flight to the airfield for refuelling. The aircraft is capable of scooping 12t of water in 14 seconds from seas with waves up to 1.2m. The aircraft flies at speeds above a minimum drop speed of 220km/h to empty the water tanks over the site of the fire in 0.8 to 1.0 seconds. The hull is of single-step design with a high length-to-beam ratio, which contributes to the stability and controllability in water, and at landing and take-off. The hull is constructed of aluminium and lithium alloys. 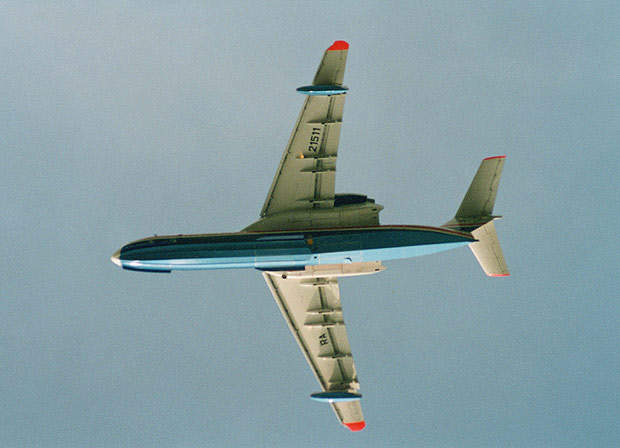 The wings are fitted with underwing stabiliser floats. 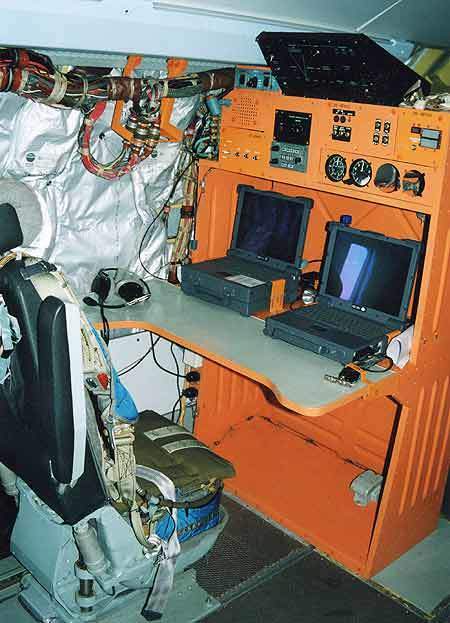 The Beriev BE-200’s cockpit accommodates two flight crew. The aircraft is equipped with an ARIA-200 digital flight and navigation system developed by Honeywell with the Moscow Research Institute of Aircraft Equipment. 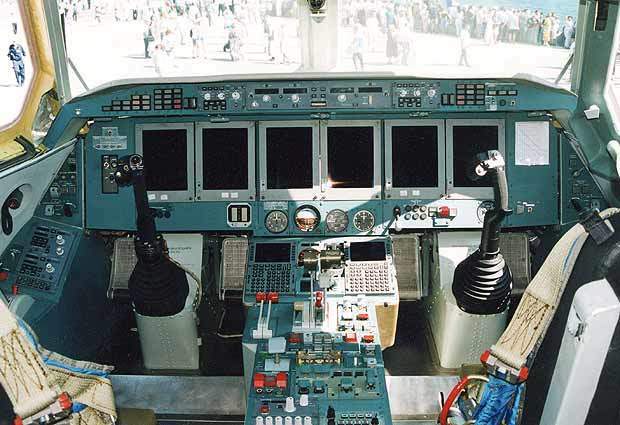 The flight deck is fitted with six 152mm×203mm (6in×8in) liquid crystal displays and a Honeywell Electronic Flight and Information System (EFIS). The cabin can be arranged in a passenger, freight, or both freight and passenger layout. The passenger cabin can be configured for up to 66 tourist class seats or between ten and 32 first and business class seats. In the cargo configuration the aircraft has a capacity for up to 7,500kg of cargo. In the mixed passenger / cargo configuration, 19 passengers and up to 3,000kg of cargo can be transported. The cargo door, 1.70m high by 2.00m wide, allows easy access for large loads. The cabin can accommodate up to nine freight containers. The cabin interior is being provided by AIM Aviation (Fliteform) Ltd, of Alfreton, Derbyshire of the UK. The two ZMKB Progress D-436TP turbofan engines are rated at 73.6kN each. The engines were developed by the Progress Design Bureau and are manufactured by the Motorsich plant in Zaporozhye. The fuel system, supplied by the US company Pall, has a capacity of 12,260kg of fuel. The engine air intakes are fitted with a de-icing system. The engine vibration control system is supplied by Endevco of San Juan Capistrano, California, a subsidiary of Meggitt plc of the UK. Each unit of the hydraulically operated retractable landing gear is twin wheeled. The landing units all retract rearward. A water rudder provides steering in the water.